That Washington has started seeking closer defence ties with New Delhi and Tokyo does not justify their contain-China "mission". The previous US administration under Barack Obama embarked on the "rebalancing to Asia" strategy not long after China became the world's second-largest economy seven years ago. In doing so, Obama accelerated negotiations over the Trans-Pacific Partnership agreement that excludes Beijing, beefed up the US-Japan military alliance, and sent warships near China's islands in the South China Sea in the guise of "freedom of navigation". New Delhi does have concerns over Beijing's increasing influence in the Indian Ocean region. It is worried that the Belt and Road Initiative (the Silk Road Economic Belt and the 21st Century Maritime Silk Road), consisting of the construction of the China-Pakistan and Bangladesh-China-India-Myanmar economic corridors, might chip away at its regional leadership. And India's strategic anxiety offers it a welcome reason to build a trilateral alliance with the US and Japan. As far as China-US relations are concerned, both countries should be motivated to cooperate rather than clash given their economic interdependence and shared interest in defusing the volatile Korean Peninsula situation. And Japan, like China, also faces mounting pressures from the possible adjustments in the US' fiscal and trade policy. The truth is, China is not a security threat to regional stability. India's real concern is that China might challenge its dominance in the Indian Ocean region, while Japan is bothered more about its disputes with China in the East China Sea. 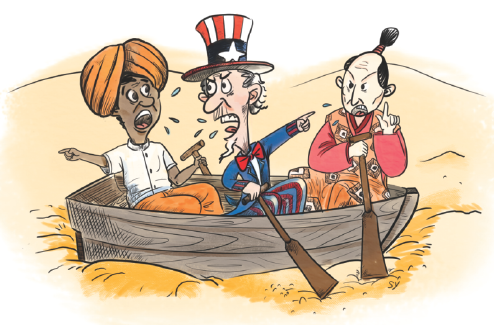 What drives Washington to keep the two allies closer is its false perception that Beijing may weaken its alliances across the Indian and Pacific oceans. There are multiple cooperative mechanisms that Beijing can use to help alleviate the three countries' concerns, and more importantly, avoid head-to-head confrontations. They share extensive interests, not direct territorial disputes, in safeguarding freedom of navigation and stability in the South China Sea and the Indian Ocean. In the long run, China could consider establishing a maritime cooperative organization with regional players including Russia, India and the Association of Southeast Asian Nations, and invite the US to join when the time is ripe.